Siliguri: A wild leopard has been lynched by villagers in north Bengal’s Alipurduar district. 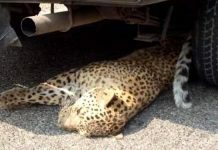 This after the leopard intruded into a potato cultivation and injured five villagers who were trying to drive it away. This has happened at Raichenga village under Falakata police station jurisdiction. Some students of a state-aided primary school at Raichenga village had noticed the adult leopard around 11.30 am while it was roaming about a potato cultivation. They at once raised an alarm. On learning this, a sizeable number of villagers turned up at the spot. 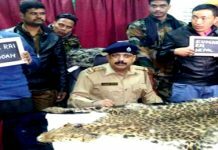 Equipped with lathis, they launched an operation to drive out the leopard. In trying to do so, five villagers ~ Tepu Das, Manojit Mullick, Nibaran Das, Shani Barman and, Sanjay Barman got mauled by the wild animal. The news reached the forest department and, thus a team from Jaldapara wildlife division rushed to the village. But even as the foresters were trying to capture the leopard by using a tranquilising dart, the villagers attacked it with lathis from all sides. As the leopard fell unconscious, the foresters rushed it to Khayerbari tiger rehabilitation centre. 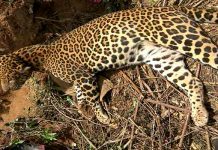 “It was badly injured and, failing all our efforts, the leopard has died around 7.40 this evening,” said Bimal Debnath, the assistant wildlife warden at Jaldapara wildlife division. Debnath said that going by norms, a post-mortem will be performed on the leopard before cremating it deep inside the forests.